In this blooming spring, Sheraton Grande Walkerhill presents the beverage of scent, sake with the finest of traditional Japanese cuisines. This coming May 25, 2007, the 'Sake Maker's Dinner' will be held at Walkerhill's Starlight. At this event, guests will be able to enjoy three of the most premium quality sakes, having been brewed for just the right amount of time to suit the Korean taste buds perfectly: The Morita Black, for an exotic fruit flavor, Mazzu Junmai Daiginzo for a bold and rich flavor, and the Geum-mun Naeno-hi Gold Medalist for a natural and refreshing aftertaste. These beverages were specifically selected by Westin Miyako Kyoto Hotel to acquire the cleanest yet most complete of tastes. 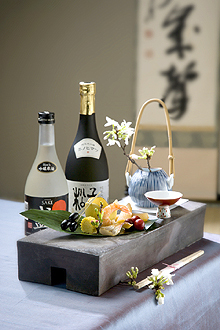 In order to maintain this perfect taste, Morita sake is specially preserved and protected to complete the meal. Morita's representative Kimijima and the Westin Miyako Kyoto Hotel's head chef Yokoyama will also be speaking about the art of Japanese fine dining and sake. To further enhance the atmosphere, a live band will be playing relaxing and tranquil music. We cannot exclude the gift give-away. Sheraton Grande Walkerhill's 'lucky draw' will include a night at the Sheraton Grande and tickets to the Walkerhill show 'Subway' (includes dinner)! Experience the flawless harmony of fine quality Japanese food with premium sake for a delicious, yet healthy way to cleanse your way into the squelching summer!